354 pages | 80 B/W Illus. This edited collection traces the impact of monographic exhibitions on the discipline of art history from the first examples in the late eighteenth century through the present. Roughly falling into three genres (retrospectives of living artists, retrospectives of recently deceased artists, and monographic exhibitions of Old Masters), specialists examine examples of each genre within their social, cultural, political, and economic contexts. Exhbitions covered include Nathaniel Hone’s 1775 exhibition, the Holbein Exhibition of 1871, the Courbet retrospective of 1882, Titian's exhibition in Venice, Poussin's Louvre retrospective of 1960, and El Greco's anniversaty exhibitions of 2014. 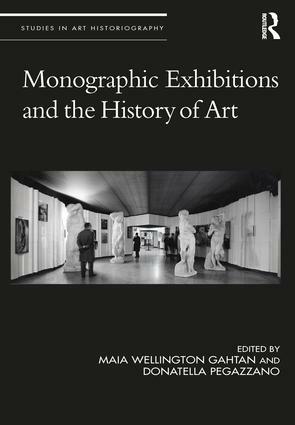 "All in all, Gahtan and Pegazzano have put together an excellent volume in which the authors have contributed a great deal of valuable art historical and museological content for our consideration. It is a book that will undoubtedly inspire further research by others, stimulate scholarly discourse, and lead to future publications of import."